I put the (not) in there for the simple fact that people assume the only type of tomatoes that you can fry are the green ones. You can use any tomato- I used yellow ones here- just make sure that they are nice and firm. Regardless of what type of tomatoes you decide on, the recipe remains the same. 1 bowl with the flour, 1 bowl with beaten egg using splash of water or milk and final bowl with seasoned bread crumbs. Heat oil in a large pan and bread them one at a time. Coat with flour, shake off excess, dredge through egg and then pat into breadcrumbs until well coated. Place tomatoes in hot oil and fry until crispy, flipping only once. 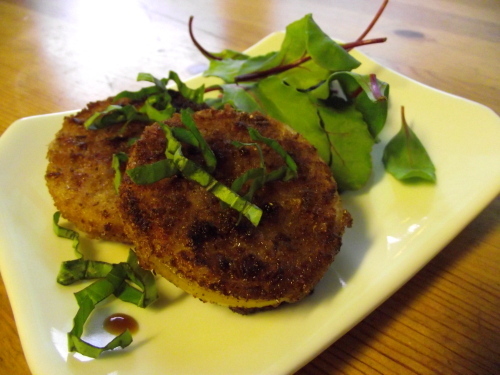 **For a different flavor, I like to serve these with a little fresh basil and a big splash of balsamic vinegar on top.